"The What" is where you would fill in exactly what this goal you are setting is. So for example, "I want to be able to do 15 pull-ups by December 31st, 2016." When you fill in your "what" it's just as important to add the "by when." With these yearly goals, that day is going to be the last day of the year, but when I create goals over a shorter time period then I find it really important to get clear on exactly when I want to accomplish this by. There is method/science to the madness of a "by when" that I won't get into because this blog would end up being way too long, but let's just say that getting clear on a "by when" helps create urgency. "The Why" simply covers why this goal is important to you. How will achieving this goal satisfy you? What will it help create in your life that you don't already have? How will accomplishing the goal improve the quality of your life? How will achieving this goal serve you in the bigger vision you have for your life? So using the pull-ups example, the reason I would like to be able to do 20 pull-ups is because I feel like the strength in my shoulders is lacking in comparison to the rest of my body. I can do about twice as many chin-ups as I can pull-ups because the focus is more on biceps and back, while for a pull-up, you use more shoulder muscles. If I am able to accomplish the feat by the end of the year I know that it will mean that I'm both at a healthy body weight and that my shoulders have strengthened considerably. Having stronger, broader, shoulders, will also mean that I'll look better in tight T-Shirts! When I first started working out regularly a few years ago, I couldn't do a single chin-up, let along a pull-up. I can probably do about 8 pull-ups today and maybe 15 chin-ups. "The How" is the detailed plan that I have come up with in order to achieve this feat. It should contain exactly what I plan to do to achieve the goal, as well as a detailed timeline for when I plan to do whatever is on the list. For the pull-up goal, it would include- doing more pull-ups! Haha. Seems obvious, but yeah, I will be doing more pull-ups on a weekly basis than I am today. So for example, let's say I set a goal within the goal, of doing 100 pull-ups per week. One other way of making pull-ups easier is... weighing less! I'm currently about 167 lbs, but if I was 160 lbs it would mean less weight for me to lift. I don't really have any interest in losing weight, but I am focused on losing body fat while increasing muscle. During my training sessions we haven't focused much on cardio because the plan was to build muscle. There was virtually nothing to work with and I will show you the before pics to prove it! There are two ways to address your body fat: diet and exercise. I have the diet part down. I eat pretty clean so it's really not an issue. So the plan here is to finally add some cardio to the program, and the goal within the goal here is to do 100 hours of cardio in 2016, which works out to two hours a week in addition to the 4 hours a week I spend in the gym with my trainer working on muscle building. If I were to make shorter goals, lets say a 3 month goal, I would also track bench marks weekly to make sure I stay on track and don't fall too far behind. So lets say, for example, my goal was to run 150 miles over a 3 month period. Each week, that breaks down to about 10 miles a week. At week's end, if I am off track and behind on the goal, I'll know I need to add more running to the next week so that I can stay on track with the bigger goal. So for example, let's say I only ran 5 miles during the week and was five behind. I would factor that in to either the next week and run 15 miles, or I could break it up different and do 12, 12, and 11 over the next three weeks. So that's essentially how I approach it and I find the journey to be the most rewarding part. Whether I achieve the goal completely, fall just short, or miss badly, the journey is where the value lies and I am not attached to the result. If I did it, I can celebrate the achievement. If I fell just short, I can take a look at what worked to get so close, and what didn't work that had me miss it. Even if I missed badly, there is learning available- was this even a goal I really wanted to achieve? If I didn't put in a great effort to achieve it, maybe it just didn't mean as much to me as I thought it did. 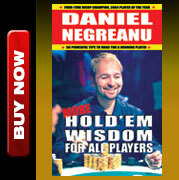 Read 12 books: I always feel better about myself when I'm reading consistently, and this goal will serve me with another big project I have in the works for 2016 that is outside of the poker world. 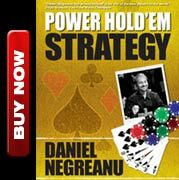 The plan is to knock out a book a month, and make sure that I'm ahead of schedule before the 2016 WSOP where there just ain't no time for reading! Beat People One-On-One in soccer: I play in two soccer leagues a week and I absolutely love it. Unfortunately, I was never gifted with the necessary footwork to take a guy on, beat him, and put one in the back of the net. Typically in these situations I look to pass, and there is nothing wrong with that, but if I was able to learn some moves I could probably score more goals, help the team more, and have more fun! The plan is to play consistently and also work with the Las Vegas Legends coach here in town. I've already learned a ton in the sessions we've had together, but let's just say it's easier for a 6 year old to improve their footwork quickly then a 41 year old poker player who wasn't even a good soccer player as a kid! Watch 50 hours of poker: This is kind of a career goal and I could have added it to my other blog, but I chose to put it in here instead. I learn a lot about my opponents when I watch them play on TV. The way they play certain hands, and of course, any physical tells I may pick up from watching. The Super High Roller circuit is a small group of players so there is plenty of footage available. I've found the PokerStars app to be really useful. Golf Handicap under 10.0: I haven't golfed a single round since May 2016. During the WSOP I was doing lots of push-ups and I think that led to me getting tendinosis in my wrists. I got an MRI to confirm and then read up on it and it just recommended rest and it should be better within 6-8 months. It's been 6 months now, and I'm ready to get back out there and get some fresh air! My handicap now is a 12.2 but if I played tomorrow I'd be closer to a 20. It won't take long for me to achieve this goal. With the added strength I'm hitting the ball much further which makes shooting in the 70's a much more realistic possibility. 25 Yoga Sessions: I've done yoga in the past and got into it, but didn't do much at all in 2015. It's really good for me to do, especially as I increase my physical activity. Often when I'm done playing a soccer game, while I was running full speed 20 minutes earlier, I can barely walk when I get home! I wouldn't say I love doing yoga, but I know that adding flexibility will serve me in achieving several of my 2016 goals and beyond. Donate "X" amount of money to Charitable Causes I'm Passionate About: I accomplish this one every year, it's an easy one! There was a mild debate on Twitter recently about how we should give, and what is the most logical approach. Some said, what you're emotional or passionate about should not influence your decision when giving, but I'm not of that camp. Giving is giving, of course, and while one person may feel like its crucial to give to our veterans, another may feel equally passionate about giving to sick kids. Is either of them wrong? I don't think so. I firmly believe in giving from your heart and to what speaks to you, whatever that may be.